I often see this around, and every time I see it I still grin cynically and ask myself, are women really this? I think this is too much of a stereotype. I’m sure, whoever had drawn this is not a woman … I mean, come-on women are penny-wisest creature on this planet, unless it’s not her money and it’s his. What do think women? P.S. I'm having problem with my comments... It's not me, it's blogger ... LOL, it would be so much appreciated if you leave a comment to test whether the counting is already working .... this may sound like fetching comments, but I'm just really anxious, hope you can help me out ... I'll get back to you ... Thank you! branded sure need to pass as even sales the cost will be above USD$30. better keep the money for bills. 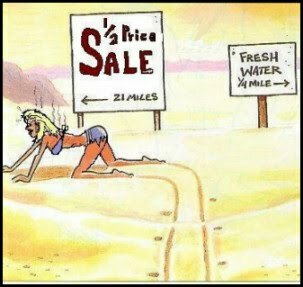 most of the stuff I bought are on sales....eehhehehe! hubby don't need to get worry of my expenses....kita ko naman sa blogging yung pinambili ko...lol! hi ate vernz! murag okay naman ni imong comments karun. Haguy murag naigo jud ko anang meaning sa picture... wahahaha! same here, i have experienced that since last night but it seems that the counting of comments has been resolved. But now, the problem is on leaving comments! I am getting an error page argh! oh and btw, I so agree with the photo. See you sa nostalgia tVernz.